8 A L M O N D O R C H A R D 2 0 2 5 G O A L S ZERO WASTE Do Almond Shells Have a Future in Plastics? Torrefaction. It may be an unfamiliar word, but it holds big prospects for California almond producers. The term has also been part of Sullivan Grosz's vocabulary for more than a year. 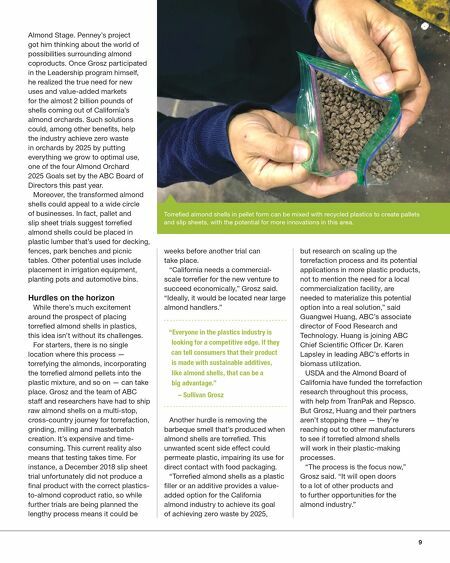 As part of his experience in the Almond Board of California's (ABC's) Almond Leadership Program last year, Grosz worked with USDA researchers and two Central Valley manufacturers to find viable ways to use almond shells as filler in commercial-grade plastic products through the process of, you guessed it, torrefaction. "It has a lot of potential, both economically and environmentally," said Grosz, who is a farmland specialist for the Fresno-based agricultural real estate agency, Pearson Realty. Torrefaction is a thermal process that converts biomass, like almond shells, into a dense, coal-like material. USDA scientists at the Agricultural Research Service, Western Regional Research Center in Albany, California, are exploring ways to use torrefied almond shells to help produce plastic pallets, slip sheets and other products. "Everyone in the plastics industry is looking for a competitive edge," Grosz said. "If they can tell consumers that their product is made with sustainable additives, like almond shells, that can be a big advantage." To date, two companies have partnered with USDA and ABC on testing aimed at finding the right ratio of plastic to torrefied almond shells for the proper strength, color and other key characteristics of potential products. Fresno-based TranPak is a domestic supplier of plastic pallets and bins. Similarly, Repsco, located further north in Riverbank, is a global supplier of thin, pallet-sized slip sheets used in commercial shipping. 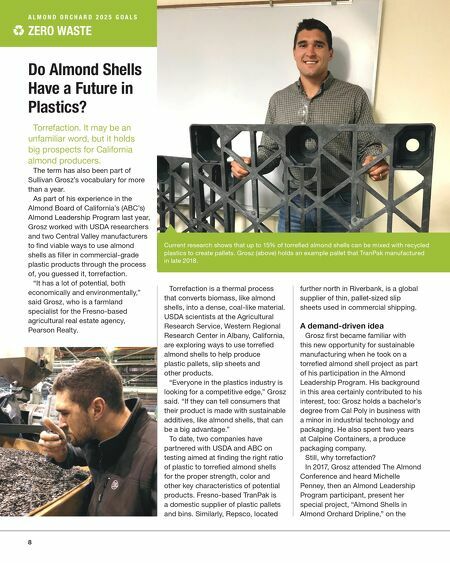 A demand-driven idea Grosz first became familiar with this new opportunity for sustainable manufacturing when he took on a torrefied almond shell project as part of his participation in the Almond Leadership Program. His background in this area certainly contributed to his interest, too: Grosz holds a bachelor's degree from Cal Poly in business with a minor in industrial technology and packaging. He also spent two years at Calpine Containers, a produce packaging company. Still, why torrefaction? In 2017, Grosz attended The Almond Conference and heard Michelle Penney, then an Almond Leadership Program participant, present her special project, "Almond Shells in Almond Orchard Dripline," on the Current research shows that up to 15% of torrefied almond shells can be mixed with recycled plastics to create pallets. Grosz (above) holds an example pallet that TranPak manufactured in late 2018. Do Almond Shells Have a Future in Plastics?